Saint Peter was born in 1499 near the Portuguese border of Spain. 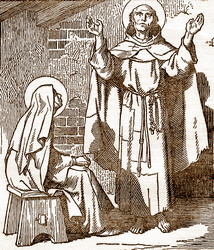 While still a youth of sixteen, he left his home at Alcantara and entered a convent of Discalced Franciscans near Valencia. He rose quickly to high posts in the Order, as a guardian, a definitor, and then Superior of the Province of Saint Gabriel. But his thirst for penance was still unappeased, and in 1539, being then forty years old, he founded the Congregation of Saint Joseph of the Strict Observance, to conserve the letter of the Rule of Saint Francis. He suffered great tribulations to conserve that Rule in its integrity. Eventually Saint Peter himself, the year before his death, raised it to the status of a province under obedience to the Minister General of the entire Seraphic Order. The Reform he instituted has since been extended even to the farthest Orient and the Indies; it is believed God ordained that it repair the ravages to the faith of the sixteenth century. The modesty of Saint Peter remains proverbial in the Franciscan Order; never did he raise his eyes to look at the non-essentials of his interior life with God. His fast was constant and severe; he lived perpetually on bread and water alone, even during his illnesses. He devised a sort of harness to keep him upright on his seat during the short hour and a half of sleep which he took every day, for forty years. He acknowledged to Saint Teresa of Avila that this mortification was the one which cost him the most. The cells of the friars of Saint Joseph resembled graves rather than dwelling-places. That of Saint Peter himself was four and a half feet in length, so that he could never lie down; his sackcloth habit and a cloak were his only garments; he never covered his head or feet. In the bitter winter he would open the door and window of his cell in order that, by closing them again, he might be grateful for the shelter of his cell. Among those whom he guided to perfection we may name Saint Teresa, who fully appreciated this remarkable director. He read her soul, approved her spirit of prayer, and strengthened her to carry out her reforms. Everywhere he could do so, he planted crosses, for the Passion of Our Lord was engraved in his heart. Wherever they were to be placed, even on mountains, and however heavy they might be, he went to the destined sites carrying them on his shoulders. From these heights he would then preach the mysteries of the Cross, afterwards remaining in prayer there. Shepherds saw him several times in the air, at the height of the highest trees of the forests. Never did he go anywhere except on foot, even in his old age. He was often seen prostrated before a large crucifix, shedding torrents of tears; and he was found in ecstasy once at the height of the traverse of a crucifix. Saint Peter died at the age of sixty-three, repeating with the Psalmist, I rejoiced when it was said unto me, let us go unto the house of the Lord! The date was October 18, 1562; he was kneeling in prayer. Reflection: If men do not go about barefoot now, nor undergo sharp penances as Saint Peter did, there remain many ways of trampling on the spirit of the world; and Our Lord teaches them, when He finds in souls the necessary courage. Be careful to preserve the unity of the Spirit in the bond of peace.